India is one among the rare country of the world which is continuing the ethnic traditions of vivid tribal life, and among the various site, culturally and historically rich Kaimur is yet un-explored. In the past, Kaimur plateau were predominantly inhibited by aboriginals i.e tribes and semi-tribes such as Oraons, Cheros, Kharwars, who now reside in the mud-built houses of nearby villages of Nauhatta, Adhaura, Tilauthu blocks. The creative traditions of the present pastoral community of Kaimur region are reflected in the constructions and decorations of their houses, celebrations of festivals, religious functions and affection with their animals stocks and have similarities with the rock-art of Kaimur region. With the evidences of settlement of aboriginals from prehistoric times, Kaimur range now holds important position for cultural and archaeological reason. Primitive folk residing in the mountains and forests of Kaimur had used the caves and rock shelters for their shelter. In the process of evolution they devised the art of engraving and painting the objects that had an impact on their lives, such as the sun, moon, animals, plants and also their own activities in daily life like hunting, running, dancing, walking, etc. 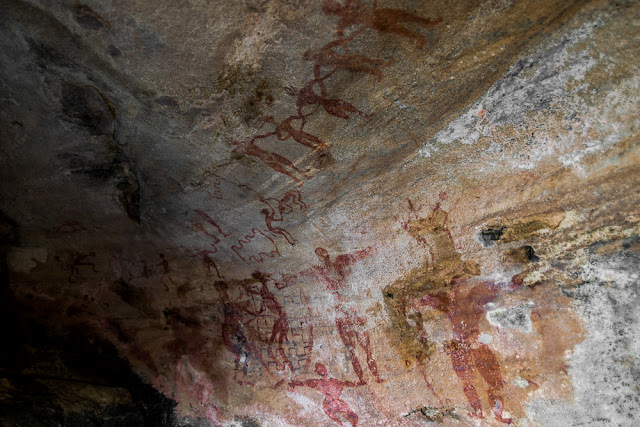 These paintings were mostly executed on the walls and ceilings of the rock shelters and caves besides faces of huge rock boulders and cliffs, which provided them their canvas to leave behind their imprint for the succeeding generations. As a result of this we find that not only in the prehistoric period but also in the historical period the tradition of painting on rocks continued for centuries. 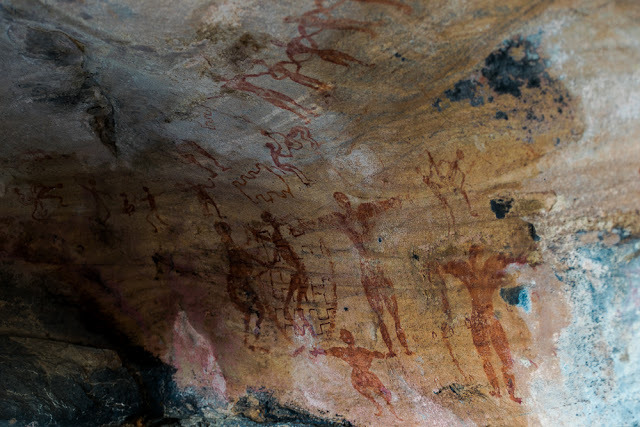 The rock paintings thus comprise various aspects of the life of the communities in different periods of history and provide very useful source material for the study of the concerned cultures. In an exploration conducted in the year 1994-95 by archaeologists more than a dozen rock painting sites have been discovered in the Kaimur district. On the Kaimur hill the sites are at Mokwas, Patesar, Jhapia hill in the Chand block, Badki Goriya in the Makarikhoh valley in Bhagwanpur block besides Dugha, Hathiadag, Sarodag, Chaya, Badap Gaura hill, Rauta and Kokhargada in the Adhaura block which is located on the Kaimur plateau. 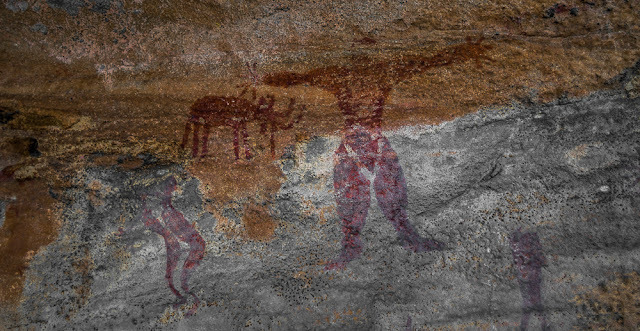 The discovery of these rock paintings are important in the archaeological perspective since the Kaimur plateau and hills have had been comparatively unexplored by archaeologists and the historians. 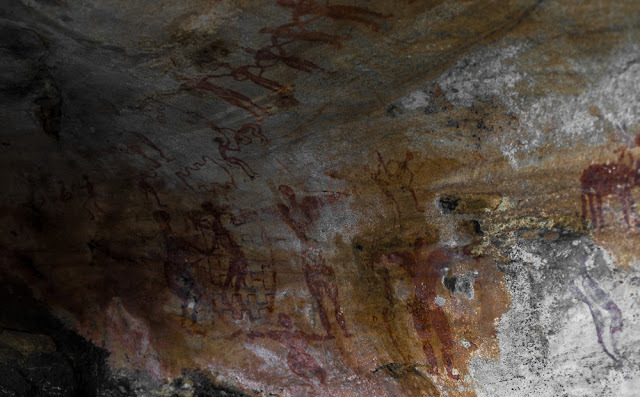 After the discovery of the rock paintings in Bhimbetka, Madhya Pradesh, in 1957, great interest has been taken by archaeologists and scholars in discovering rock painting sites in different parts of India. In Bihar also some positive efforts have been made in recent times by some scholars in this direction as a result of which rock paintings have been found at many sites in Nawada, Jamui and Rohtas districts in Bihar. 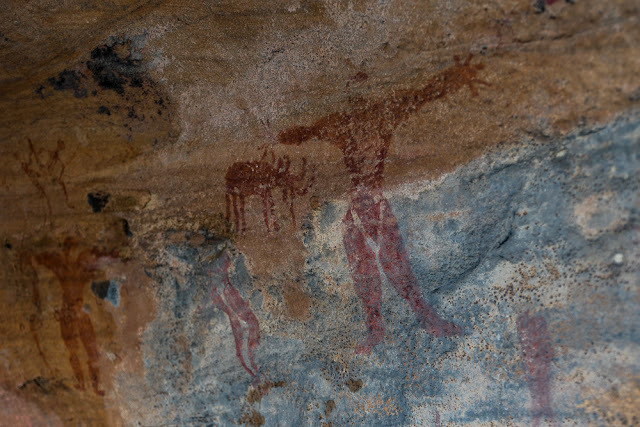 So far as the rock paintings in the Kaimur district are concerned it appears that, in spite of some distinctive features, their nature, style and content as compared to those in other rock painting sites of Central and Southern India, Africa and Europe, have certain remarkable similarities. The rock paintings in Kaimur district had been created on the smooth surfaces of the inner walls and ceilings of the rock shelters and caves located on the hills mostly in and around jungles and nearer to some water source like river, lake, streams, etc. 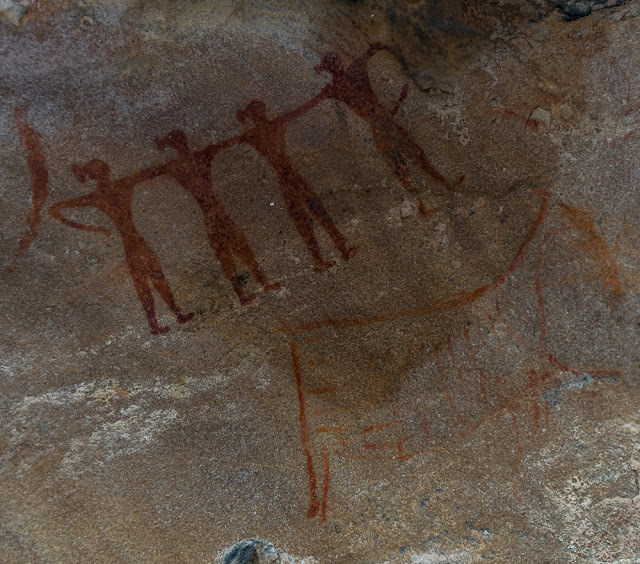 The paintings on the rock surfaces generally have horizontal or vertical composition oriented towards left, right or top. 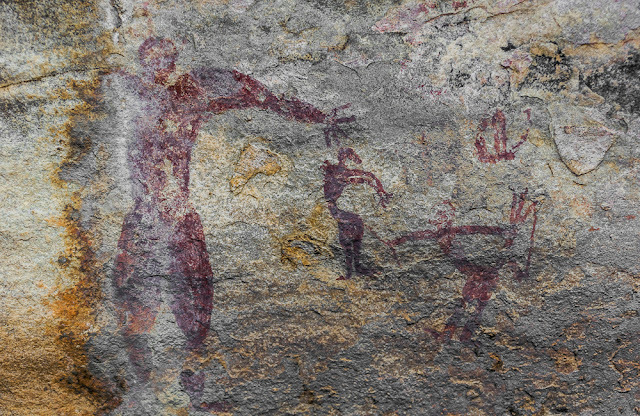 Most of the illustrations in the rock paintings are in different shades of ochre that was probably prepared by utilizing the hematite abundantly found on the surface of the rock shelters and in the nearby areas. However, sometimes black, white and light yellow colors have been also found to be used in the paintings. The creative traditions of the present pastoral community of Kaimur region are reflected in the constructions and decorations of their houses, celebrations of festivals, religious functions and affection with their animals stocks and have similarities with the rock-art of Kaimur region. The tradition of painting the walls of the houses with sometimes the same kind of symbols and patterns as seen in the rock paintings, is still continues in some tribal region of Kaimur. The tradition of color preparation with the powdered geru (hematite), oil, sindur (vermilion), juice of the bark of trees and of beans and other vegetations etc is also prevalent even now among the tribes of this region. One can thus understand that this tradition of color preparations and using them for painting various figures and patterns on the walls may have been handed down from generation to generation since the earliest rock painters devised them. The rock paintings of Kaimur region also remarkably show great similarity with the rock paintings of Mirzapur district, Uttar Pradesh. This is mainly due to the fact that the Vindhya Range extends right from the Mirzapur district up to Sasaram in the Rohtas district and the Kaimur hills and plateau in the Kaimur district forms a part of the same range. It is mentioned that among the 240 rock shelters of the Mirzapur, about 62 rock shelters have been classified from the Kaimur group. These rock shelters, of the Kaimur group in particular, are in close proximity to the rock shelters in the Kaimur and Rohtas districts in their geographical and geological setting and so the style, content, subject matter etc. in them also show great affinity. This Kaimur region has immense potential to be among the best tourism destination with these Rock-Paintings, various monumental heritage like Rohtasgarh and Shergarh, several beautiful waterfalls and mesmerizing landscapes. As no major archaeological, ethnographic and historic research or excavation had carried out in the Kaimur region, as well not well developed and promoted for tourism so whatsoever we are seeing is just like a drop in the ocean. P.S: All the above contents are excerpts of conversation between Gargi Manish and Dr. Shyam Sunder Tiwari, who discovered the above Rock-Paintings and whose intensive historical research for Sasaram, especially for Rohtas will be remembered forever.